So if you read my last post, you know that I’ve pledged to cook even healthier meals for my family as a result of the Jamie Oliver Food Revolution show on ABC. So I’m going to be sharing with you some of the meals I’m cooking for my family, in hopes that it will help inspire others to cook healthier too. My main goals: use fresh ingredients whenever possible, increase the veggies, and reduce the use of processed food. We are eliminating fried food entirely from our diets. While we didn’t fry a ton before, my kids ate chicken nuggets when out, and I fried a couple times a month at home. Grilled sesame ginger chicken breasts, sesame soy string beans, and steamed rosemary and thyme potatoes. It actually was a cynch to make…under 30 minutes, not counting the marinating of the chicken. For the chicken, I used a Sesame Ginger marinade I had on hand (I would make the marinade myself next time to reduce the sodium, but it was in my cabinet and I wanted to use it up.) I put it in a ziploc bag with the chicken, and let it marinate for 24 hours. To cook, I simply put it on my George Foreman grill for a few minutes, until cooked through. For the string beans, I heated a combination of olive and sesame oil in a pan with a clove of chopped garlic. Once it was hot, I added the string beans and stir fried quickly. I added 1/4 cup of water and let cook until the string beans were cooked, yet still slight crisp. Added a splash of soy sauce, and removed from heat. For the potatoes, I chopped some regular baking potatoes into even, 1 inch or so chunks (you could also do this with baby new potatoes without chopping.) I put them in a pan with a little water, covered, and let steam until potatoes were cooked through, about 10-15 minutes. When done, I tossed the potatoes with a little olive oil, kosher salt, pepper, crushed rosemary, and thyme. Easy! I hope that this inspires you to cook some healthier food for your own family. If it does, please let me know what you’re cooking! And if you’re blogging about it, feel free to post a link to your meals on your own blog from within the comments. It would be great to provide a resource of recipes for everyone. Here’s to a healthier nation! 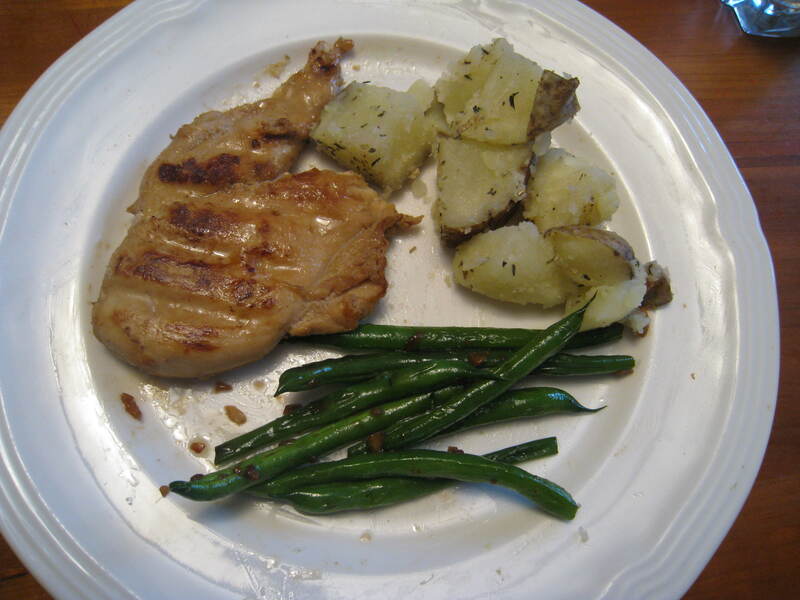 This entry was posted in chicken, Jamie Oliver Food Challenge, vegetables and tagged chicken, Jamie Oliver Food Challenge, potatoes, string beans. Bookmark the permalink.